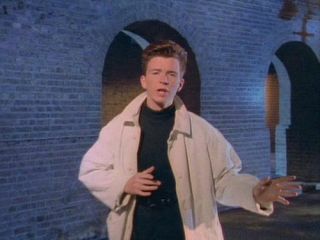 Rick Astley has been named the Best Act Ever at the MTV Europe Music Awards. The 1980's red-haired sensation beat the likes of U2, Green Day and Britney Spears to take home the title. When the nominations were announced several months ago, someone in the MusicRadar office was overheard saying: "I'll eat my hat if Astley wins." That someone doesn't actually wear a hat, so we brought a fedora and he's eating it. It was a foolish statement. According to SurveyUSA, 18 million American adults alone have been Rickrolled. That's a lot of free advertising. If you've never had the pleasure, click here.